Conveniently situated in central Perth (just 1.4km north of the CBD); the patient/client enjoys easy-access parking (either paid or free), a previously unsurpassed level of anonymity, whilst receiving the highest possible standard of care, in the surety of a pleasant, relaxed and yet always professional, therapeutic milieu. Like me, I’m sure you have all known immensely diligent, highly conscientious and very proficient plumbers (for example); people who truly deliver in all areas. However, it is equally possible to happen upon their polar-opposite: the completely shocking individual who, in point of fact, creates more problems that they were recruited to fix in the first place. Having spent a lifetime in the mental health arena, I am deeply ashamed to admit that equally, the medical profession is unfortunately no different to any other. Although it is wholly understandable to assume that all Counselling & Psychotherapy practices are identical, and therefore all mental health clinicians are equally capable of delivering the same outcome; the uncomfortable truth of the matter is, they don’t. 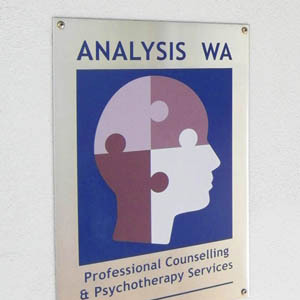 My private practice (Analysis WA) was thus born out of the frustrations and inconsistencies experienced as a clinician in hospitals and larger clinics. Where bureaucracy, stifling administrative restrictions and limited therapeutic scope, can prevent the simple delivery of gold standard, highly specialised, and crucially, individualised care. With two undergraduate & two postgraduate qualifications, one quarter of a century’s experience, and many thousands of people helped thus far; I can honestly say, that the process employed here works. Hopefully now you can begin to see the utter folly in shopping around based on price alone. For the only thing that can truly be guaranteed, will be the acquisition of the cheapest product. Which almost certainly will not serve you best.